Godfrey Dambuleni uses recycled tins and sheet metal to make his sculptures and trophy heads of African animals. Over the years he has evolved his own distinctive style, patchworking colourful tins or unpainted metal to make original one-off art pieces. He’s recently completed an almost full-size black lion that guards the entrance to the craft market. How did you develop your patchwork style of recycled art? I started off doing the weaving method, cutting strips of recycled tins and weaving them onto the metal frame. But then when I had colourful tins, you couldn’t really see the prints and patterns. So I started cutting the pieces bigger and patchworking them, using different colours and letting the logos and designs be seen so that they became part of the story. What types of recycled metal do you use? I don’t use the modern aluminium drinks cans any more as the metal is too thin, it bends and breaks too easily. I use thicker metal tins, such as biscuit tins, the metal tins that Jack Daniels comes in, olive oil tins, Doom cans and so on. You can see different well-known South African brands in my colourful sculptures, as well as other interesting tins that come my way. All these I get the scrap metal yards to collect for me and I buy from them. The plain metal I use comes from sheet metal used for making bottle tops. The reject metal is sold to the scrapyards and I get it from them. What is your making process? I shape all the wire frames for my trophy heads and sculptures. I have a team of four who help me. One guy opens up the tins and cleans them. Then others cut the patchwork shapes, according to the piece we’re working on, and punch holes in them. Then it’s arranging the pieces and colours into a design that works and wiring them all together. I do all the final shaping and finishing touches, and of course I go over each piece to make sure there are no sharp edges sticking out. There’s a final sealant coating the plain metal pieces so that it won’t rust. We still make rhinos and other small sculptures using the weaving technique as well. 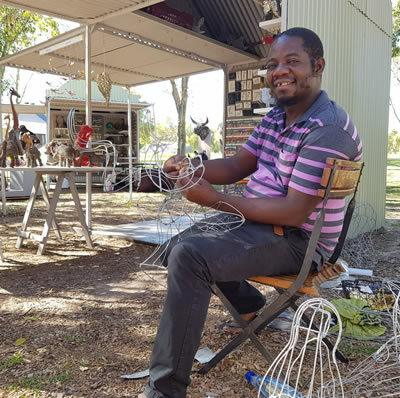 See Godfrey’s sculptures and trophy heads at the Craft Market at Spier, open every day through the summer season from October to beginning May 2019 10h00 to 17h30.